It was a warm Sunday morning in Naperville as we hit the road to 1661 Quincy Ave. We were fighting the church traffic, but this week our Sunday school was at Solemn Oath Brewery. 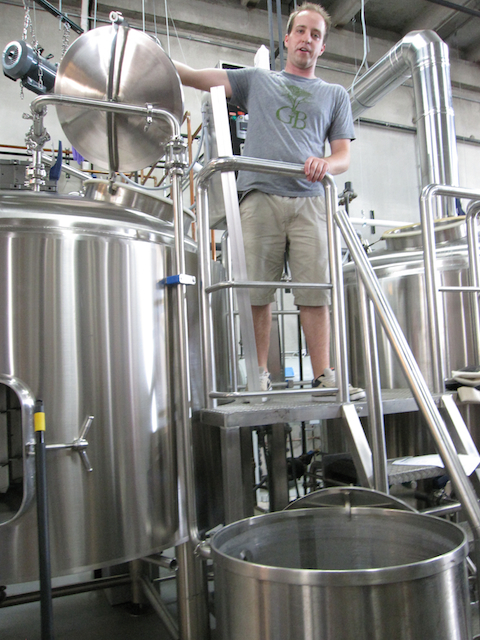 The topic was all-grain homebrewing and the teacher was Solemn Oath assistant brewer/beer blogger, Paul Schneider. My fiancée and I have been wanting to jump from extract to all-grain and we’ve wanted to visit Solemn Oath ever since we tried their beers at Beer Under Glass earlier this year, so this event was perfect for us. 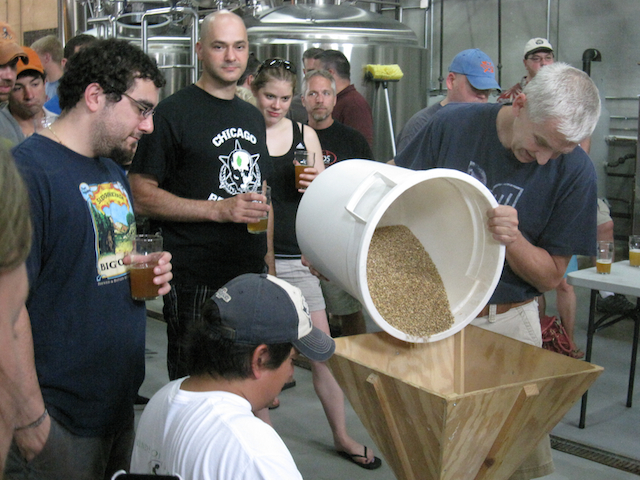 The class was two hours long, focusing only on the steps prior to boiling the wort (milling, mashing, and lautering). 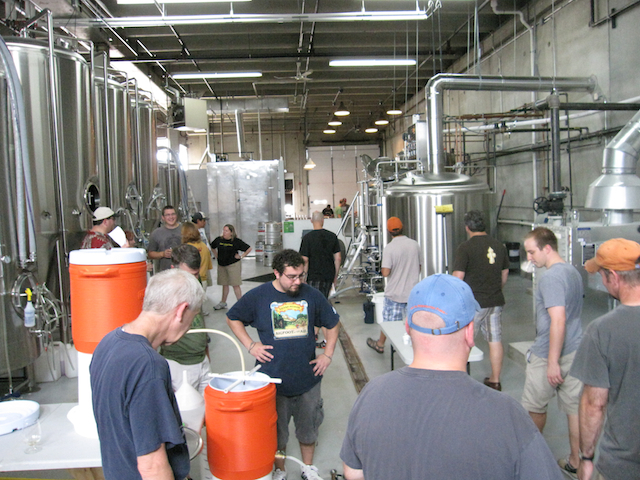 We arrived at the brewery shortly before 11:00 AM and gathered round with the other attendees. There looked to be about 20 people in attendance. After Paul introduced himself to the group, we checked in with the bartender and received one of our two complimentary beers. I opted for Snaggletooth Bandana (American IPA). They were also offering Yarnbomb (Cascadian Hefeweizen) and E-Ville (American Brown Ale). This was my first time trying Snaggletooth Bandana, but the citrusy IPA was great for a warm summer day. I’ve only had a handful of their beers, but I’d say that so far Snaggletooth Bandana is my favorite beer in the Solemn Oath lineup. After we got our drinks, the lesson began. First, Paul passed out the recipe for the day’s brew: a homebrew version of Solemn Oath’s Whisper Kisses (Saison). 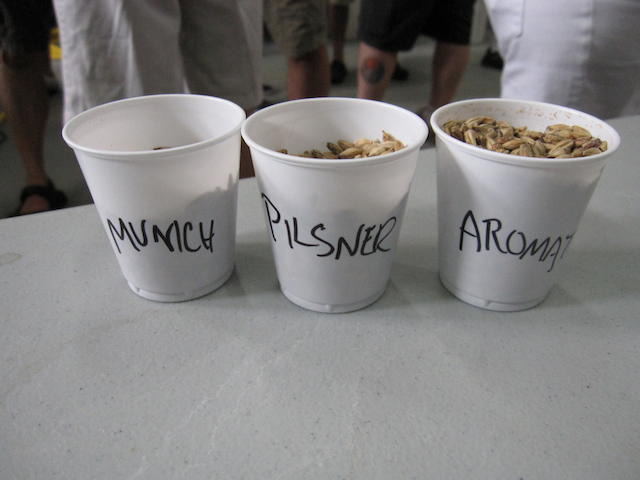 We did a quick run-through of the ingredients and passed around samples of the malts that were going into the mash. After that, we began heating the strike water for the mash and milling the grain. Paul discussed how the temperature of the strike water can affect the sweetness of the mash, with higher water temperature leading to a sweet mash. Once the strike water reached the desired temperature, the water and the milled grain were added to the mash tun, which in this case was a modified Rubbermaid insulated cooler fitted with a false bottom. The mash sat for about 25 minutes while we enjoyed our second beer break of the day. I should have tried another beer but the Snaggletooth Bandana was too good to resist. 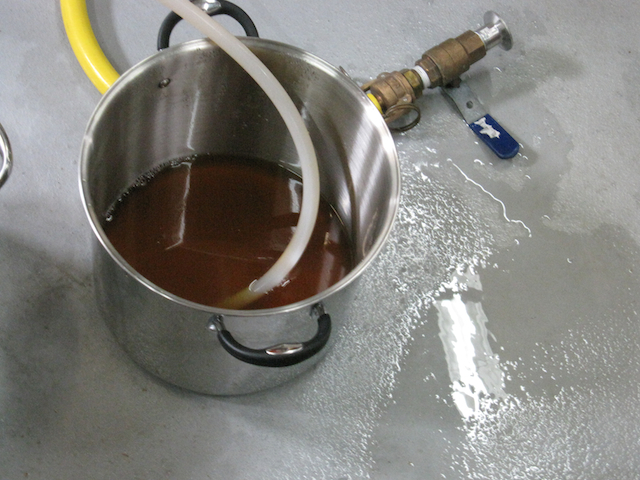 Next, the mash was recirculated by draining the mash tun and carefully pouring the liquid back into the cooler. Basically, pouring the wort back into the mash tun clarifies the liquid by using the grain as a filter. After recirculating the grain, we had to sparge the grain. Sparging involves rinsing the grains with water to pull out more sugars. Water temperature is very important to this step. Paul mentioned that you want to keep the temperature below 170° to avoid leaching tannins. 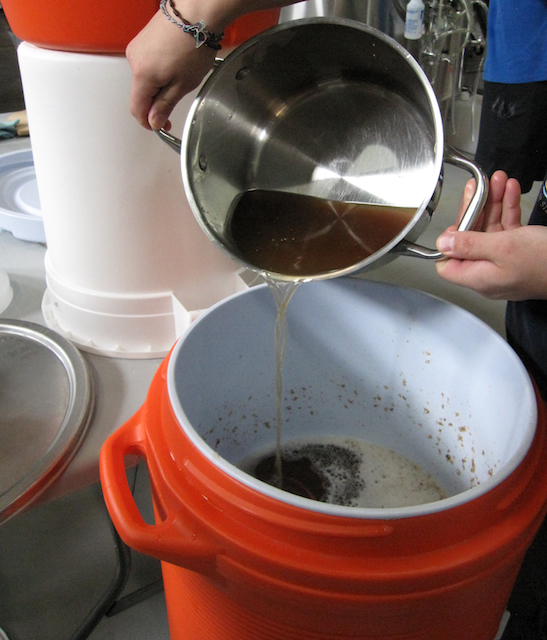 For this batch, water was slowly and continuously added until the sparge was complete. While waiting for the sparge to finish, we went on a quick tour of the brewery and had a short Q&A session. Once the sparge finished, the wort was ready for the boil and class was officially over. Overall, it was a great time. Paul was very informative while also encouraging all attendees to participate. The beer on tap was refreshing, especially on a hot summer day. Even though you can get their beers in Chicago, Solemn Oath is worth making the trek to Naperville to visit the brewery. 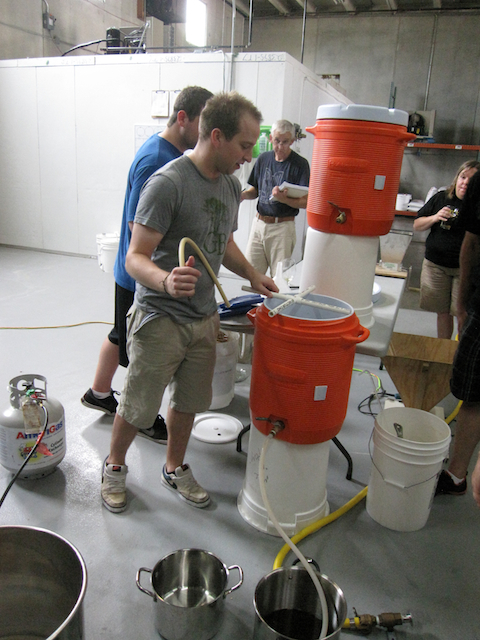 Also, if you are interested in getting schooled in the ways of all-grain homebrew, they have another class upcoming on August 19th. Homebrewing, Naperville, Solemn Oath. Bookmark.